This wasn’t the pie I was planning to bring to you today. It was supposed to be rustic and oozing with fruits, folded up into a neat little parcel and served up as a galette. It was going to have a beautifully crumbly shortcrust base, piled high with soft fruits and served with a dollop of vanilla ice cream. One solitary wisp of heat was supposed to escape from the top as I took pictures, with me probably dressed in jeans and looking forward to a nice glass of red with my dinner. Currently I am sat in shorts, sandals and a t-shirt sipping pink wine as I write this. What happened? Apparently Aberdeen isn’t quite done with the sunshine yet and we are currently experiencing a bizarre Sunday heat wave. The beach was crammed with families earlier; I noticed a couple corking a bottle of white around 2pm in their garden and the lawnmowers were out in force. This was definitely not pie weather. Or was it? 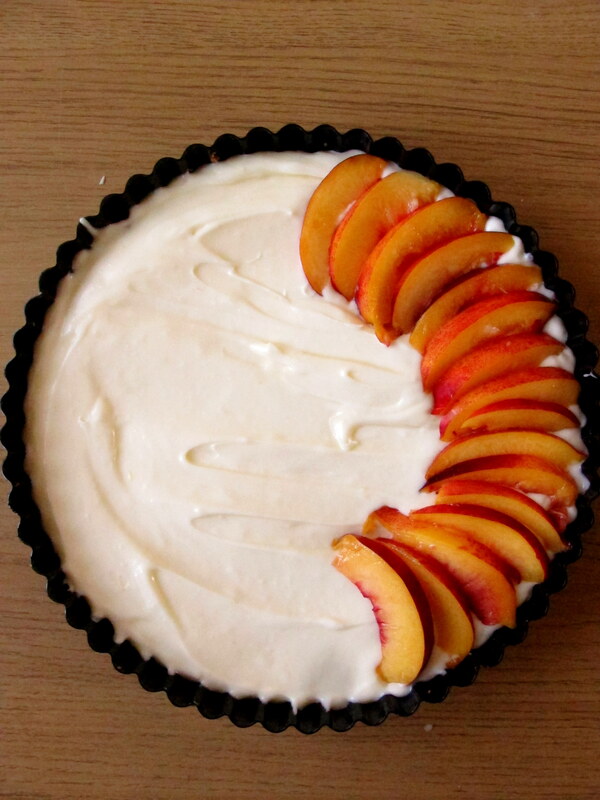 As I racked my brains for a baking replacement I recalled a no-bake peach pie from the Sprouted Kitchen. 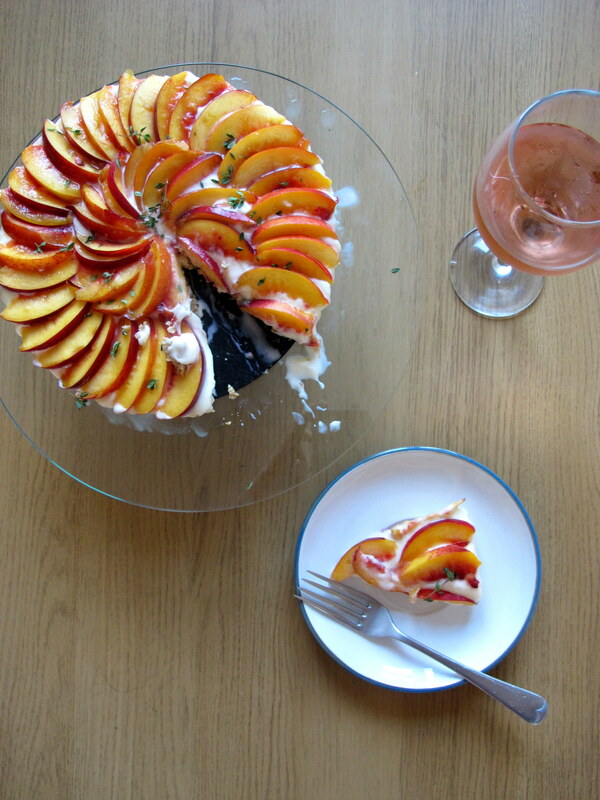 I pulled out my cookbook of the same name and quickly dreamt up a riff on this beautiful summer dessert. The base is inspired by the lemon thyme crumble in the book and acts as a flapjack base on which the creme filling is spread across. It is soft and oozy – more pudding-like than a clean cut slice of cheesecake – and acts like a self-saucing accompaniment to the fragrant ripe peaches. Whipped up in no time, this summer beauty was duly hidden away in the fridge to set in one of the easiest bakes I’ve ever made. With the oven only required to crisp up the base, this is the perfect Sunday treat when the weather takes an unexpected turn for the better. Cheers! Note: The filling of this pie is quite wet and therefore needs to be refrigerated overnight. If you can’t wait that long, I’d suggest filling with some lemon scented whipped cream for a speedier option. 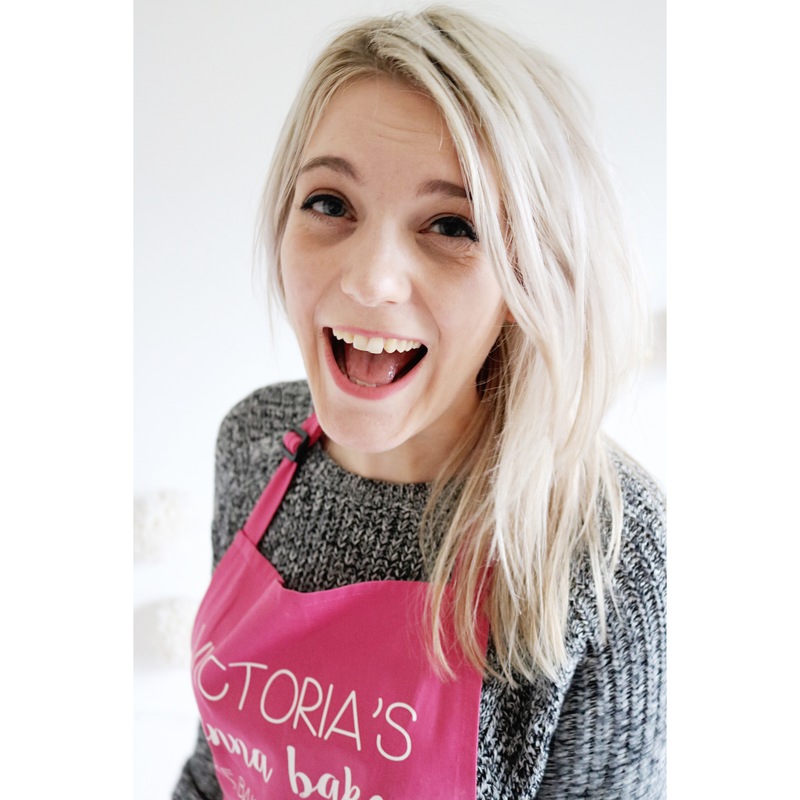 Preheat the oven to 200oc/180oc fan/gas mark 4. Heat the butter and honey together in a saucepan over a medium heat until melted then pour the mix into a large bowl. 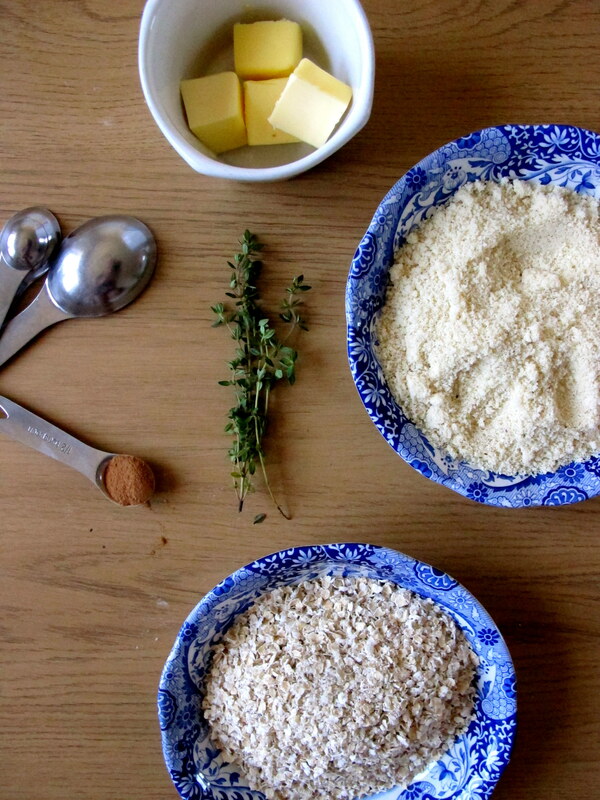 Add the almonds, oats, cinnamon and lemon thyme leaves and mix together until crumbly. 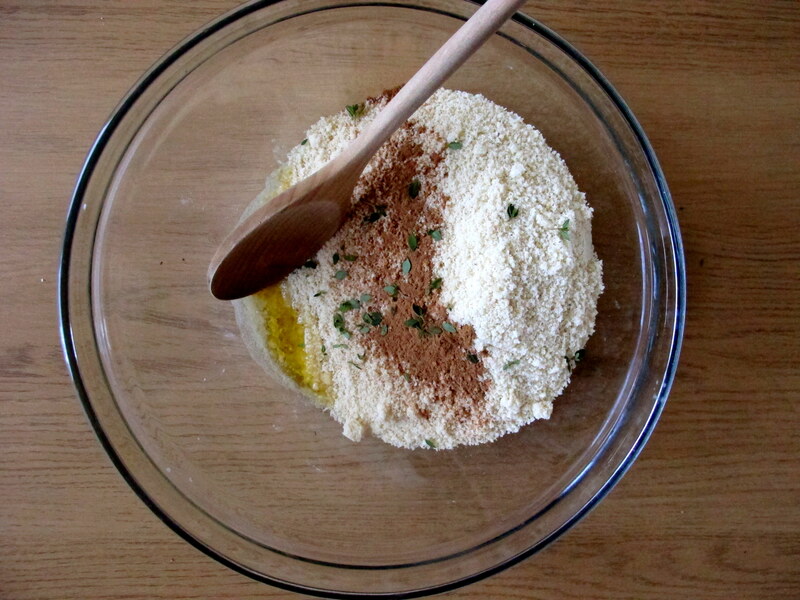 Take a little of the mix in your hands and squeeze – it should clump together and be slightly sticky. If not, add a couple of splashes of water and mix again – do this with your hands to gage the right amount of moisture required. 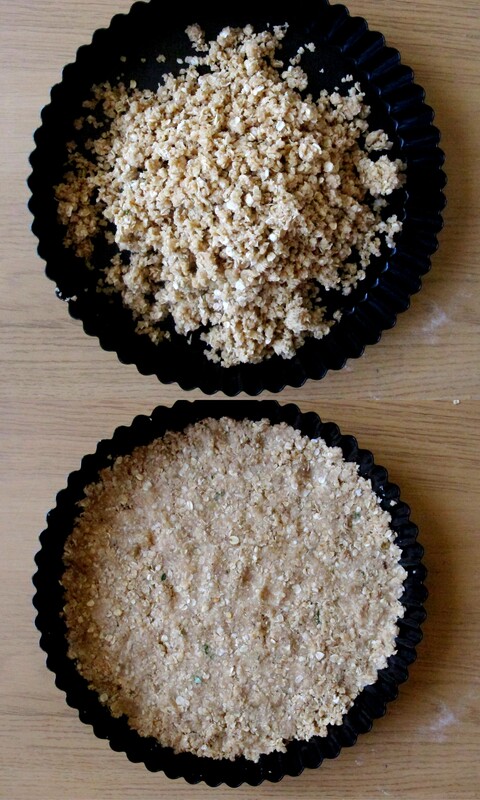 Press the crumble into a 23cm fluted tart tin with your knuckles until even and smooth then place in the oven. Bake for 10 minutes until the crumble crust is golden then remove and cool completely. Place the crème fraiche, icing sugar, lemon zest and juice in the bowl of a stand mixer or in a large bowl if using a hand held mixer. Using the balloon whisk attachment, whip the mix together to soft peaks then spread on top of the crumble crust. 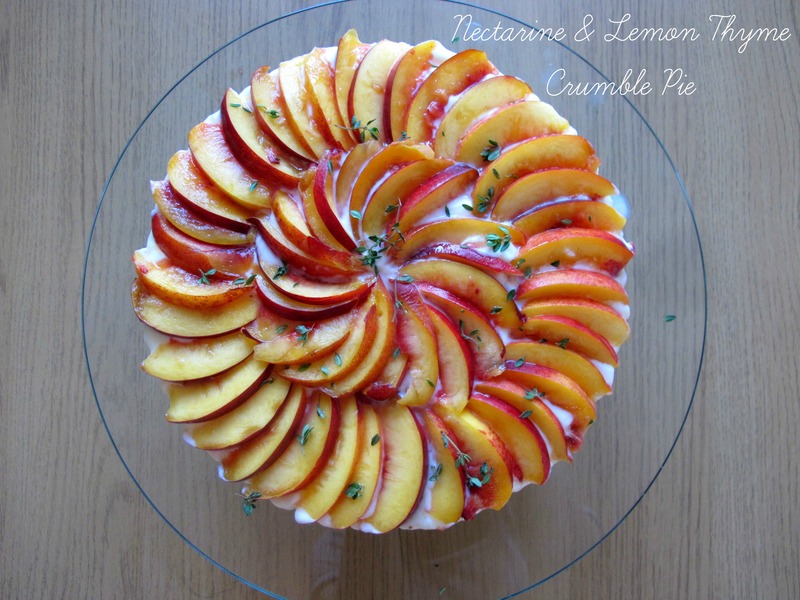 Thinly slice the nectarines and arrange in concentric circles on top of the crème filling. Place in the fridge to set overnight. To serve, squeeze over a little lemon juice and sprinkle over some extra lemon thyme. Slice into wedges and enjoy with pink wine.